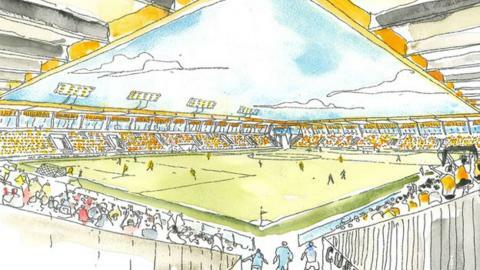 Cambridge United are to go it alone with plans for their new community stadium after a possible groundshare came to nothing. United will be the sole primary tenant after Cambridge City and the local rugby club ended their interest. However, Anglia Ruskin University's sports science department and fitness organisation CORE Cambridge will have use of the facilities. It is hoped the stadium could be ready for the 2016-17 season. A planning application is likely to be submitted by the end of this year or beginning of 2013 but the Trumpington Meadows site is currently greenbelt land and will have to be reclassified before the go-ahead can be given. An 8,000 capacity has been confirmed and there will be terracing at one end for home supporters. The Abbey Stadium has been Cambridge's home since 1932 but Grosvenor Estates, who have been the club's landlords for the last two years, want to redevelop the site. Grosvenor's plans for Trumpington Meadows would see the new stadium being part of a sporting village, which would also incorporate 450 new homes. "London 2012 has provided us with a marvellous opportunity. The benefit of sport and fitness has come under the spotlight. The Cambridge Sports Village will provide a unique facility for Cambridge and the local area," project manager Ed Skeates told a stakeholders' meeting. Having previously expressed an interest in the project, Cambridge City, who play in the Southern League, are now planning a new 3,000-capacity stadium of their own close to Sawston village, which lies south of the city. The lease on their current Milton Road ground expires at the end of the season and they are set to groundshare with Newmarket Town until their new home is ready. "The site, until fairly recent years, was an old brick dump, so there was basically a rather large hole in the ground which has gradually been filled in over the years. "There's plenty of room there for a fairly large sporting facility for ourselves and the village of Sawston," chairman Kevin Satchell told BBC Radio Cambridgeshire. "It makes sense in some ways for two football clubs to share a stadium but you're also sharing the income from the stadium and from our point of view as a business, it will be much better for us to have our own facility."